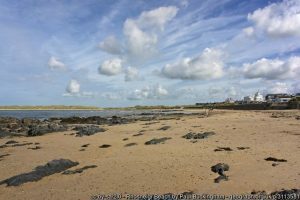 Winner of both a Rural Seaside Award and a Green Coast Award, Rhosneigr lies on Anglesey’s western shore. With its two broad, sandy beaches, Traeth Crigyll and Broad Beach (Traeth Llydan), it is a popular centre for all water sports. Rhosneigr is superb for walking on the beaches, with their rocky outcrops and dramatic sand dunes. There is a nature watching at nearby Llyn Maelog , a reed-fringed lake known for its bird life, in particular Great Crested Grebes, Little Grebes and various ducks. If walking to the lake, look out for the dune flowers.